heliosolaire offers a wide range of domestic wind turbines among the most reliable on the market with high production yields for your wind turbine installation project. The wind turbines selected from our suppliers and distributed by heliosolaire were rigorously selected on criteria of high quality and reliability optimum. BERGEY wind turbines are the reference in small wind turbines. American manufacturer of small domestic wind turbines with 30 years of experience. Bergey Windpower is one of the world’s largest producers of small wind turbines. The Bergey Excel 5 and 10 wind turbines are ideal for dwellings, farms and small businesses. 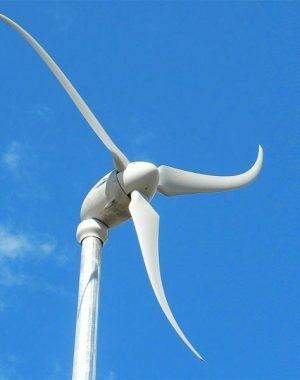 Its extra-large rotor and the low wind speed required for its start-up give it exceptional performance, exceeding the production of other turbines in its class. Connected to the grid, Bergey BWC Excel can meet the energy needs of a mid-sized residence located on a site with moderate winds. 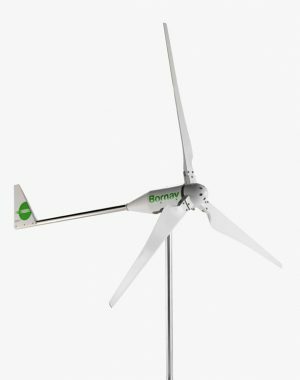 The Spanish manufacturer Bornay continues its development with its range of domestic wind turbines with a power range of 600,1500,3000,6000 watts. Bornay Small Windturbines, is a complete line of wind turbines, with a nominal power between 0,6 to 6 kW, that can provide energy to all kind of installations, mainly cabins, homes, small companies, farms, telecom sites … Bornay small wind turbines are designed to work in parallel with solar PV systems. The combination of a wind turbine with a solar photovoltaic system guarantees a stable energy production in almost all weather conditions. Bornay have been piooners in harnessing the power of the wind since 1970. 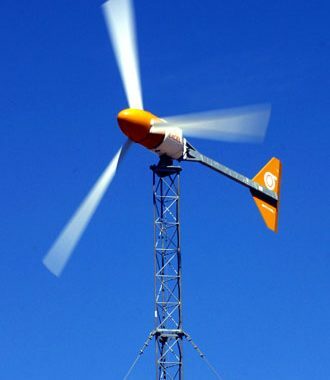 The Bornay wind turbine is designed from a mixture of fiberglass and carbon fiber to ensure optimum resistance in extreme outdoor conditions and also to facilitate the operation of a starting with a wind of only 3.5 m / s.
The wind turbine Skystream 3.7 designed in the United States in Arizona is a reference in the small wind for the residential.The Skystream 3.7. is the first domestic grid connected to the grid that produces electricity at a lower cost than most suppliers. The particular wind turbine Skystream 3.7 owes part of its success to its performance but also to the design of the generator whose shape of the pale remains unique in the small wind sector. The management of the wind turbine for individual Skystream 3.7 is totally computerized thanks to the Skyview software and allows you to display graphs and to export the history of production of energy of the wind turbine. 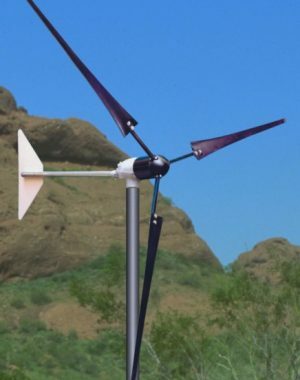 Whisper wind turbines designed in the USA can be used for a variety of battery-charging applications such as off-grid homes, telecommunication sites and water pumping applications. 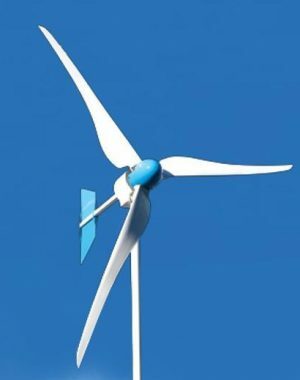 The WHISPER range is made up of 3 wind turbines for individual power units called Whiper 100, Whisper 200 and Whisper 500.The Whisper windturbines is equipped with a brushless permanent magnet alternator and a lateral erase system to maintain optimum performance by any wind conditions. Unlike many competitors, the Whisper Controller includes a diversion charge to ensure safe and discrete operation of the wind turbine when the batteries are charged. Founded in 1999, in South Africa, Kestrel has been present on the small wind market since its creation with powerful and reliable models. The Kestrel small wind turbine range is available in four specific models depending on the application: 160i (600W), 230i (800W), 300i (1000W), 400i (3000W). On a favorable site, it can generate most of the needs for a home. With its variable pitch blade system that regulates the speed of rotation, Kestrel wind turbines remain productive even in the strongest winds (60 m / s), unlike competing models that go into protection. 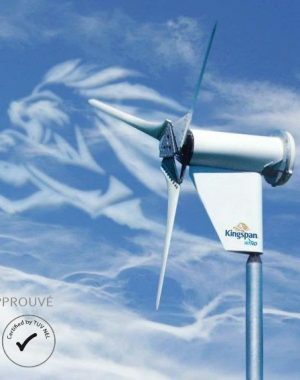 Kingspan wind turbines formerly Proven have been designed for more than 25 years and are regularly chosen for their resistances and their reliability in all tests. The Kingspan wind wind turbine range offers two generators rated at 2.5 Kw for the Kingspan Wind KW3 and 5.2 Kw for the Kingspan Wind KW6. The Kinspan wind turbine range is manufactured in Europe and is renowned for its ability to withstand high wind speeds thanks to its proven mechanics in the most extreme locations in the Globe.